Today (March 4, 2014), a Sacramento County Superior Court judge ruled that the Court would consider arguments from plaintiffs in the Court case Tos v. California High-Speed Rail Authority about the failure of California High-Speed Rail to comply with travel time requirements in Proposition 1A. Read the decision: Ruling on Submitted Matter: Motion for Judgment on the Pleadings – March 4, 2014. We are very gratified by Judge Kenny’s ruling denying the High-Speed Rail Authority’s motion. The Authority was, in essence, trying to shut the case down. Our position is simply that if the Authority want to use the bond funds, it has to build what it promised the voters. Our complaint says that the Authority’s project doesn’t meet requirements for the high-speed rail system that were set when California’s voters approved Proposition 1A. Judge Kenny’s ruling means we get our day in court to prove our case. If we’re successful, it will mean the Authority can’t use the bond funds to build their non-compliant project. In November 2008, 52.7% of California voters approved Proposition 1A, the “Safe, Reliable High-Speed Passenger Train Bond Act for the 21st Century.” Prop 1A authorized the State of California to borrow $9.95 billion for high-speed rail by selling bonds. Today (February 20, 2014) a coalition of construction trade unions held a rally outside of the “Protect Agriculture and The Valley” fundraiser in Hanford organized by the Citizens for California High-Speed Rail Accountability (CCHSRA) and Kings County Farm Bureau (KCFB). Here are excerpts from a CCHSRA and KCFB joint media fact sheet distributed at the event. • The court ruled in our favor. “The funding plan failed to comply with the statute.” – Proposition 1A (Part 1 and the Validation Case) ruling by Judge Michael P. Kenny, Superior Court of California, County of Sacramento on August 16, 2013. The Court has ruled that the California High-Speed Rail Authority has been attempting to operate illegally. Read our court victories. • The economy in Kings County is based on agriculture. Farming has been the fabric of Kings County since the 1800’s. We want to preserve it for future generations of farmers. We help feed and clothe the world. • There is more at stake than farmers worried about their livelihood. California’s Cap-and-Trade funds, education funds and general fund are also negatively impacted by the California High-Speed Rail project. 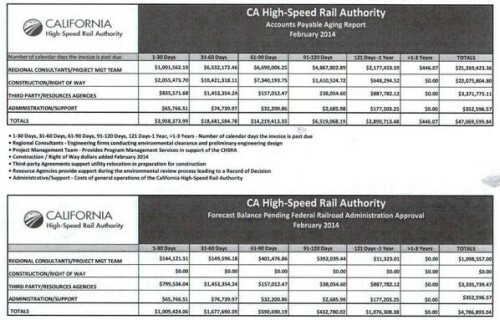 California High-Speed Rail Authority struggles to pay its bills. • Existing jobs and livelihoods that are directly in the path of the California High-Speed Rail will be destroyed, while job creation promises are tarnished by diminishing funds. Small businesses and large businesses cannot absorb not getting paid by the California High Speed Rail Authority. Job creation is to create a job that people are actually getting paid for….and not by an entity already behind in its bills. • The Authority is also having a hard time meeting the travel time requirement of Proposition 1A. •We are looking forward to having our case heard at the appellate level. • The Kings County Farm Bureau is a non-profit advocacy organization, which represents approximately 800 members of the agricultural community. The mission of KCFB is to provide education, promotion and representation of agriculture. •Citizens for California High Speed Rail Accountability (CCHSRA) is a nonprofit, nonpartisan advocacy group based in Kings County whose members reside in the city of Hanford and surrounding rural areas, along with other Californians who are affected by the high-speed rail. The group has been in the forefront since June 2011 attempting to get the California High-Speed Rail Authority (CHSRA) and its board to be in full compliance with Proposition 1A which the state’s voters passed in November 2008. Hanford, CA February 19, 2014 – Citizens for California High Speed Rail Accountability (CCHSRA) and the Kings County Farm Bureau (KCFB) will co-host a fundraising luncheon/reception to “Protect Agriculture and The Valley” on Thursday, February 20th, 2014 at the Civic Auditorium in Hanford, California. Special guests include Congressman David Valadao, Assemblyman Frank Bigelow, Assemblywoman Shannon Grove, Assemblywoman Diane Harkey and Assemblyman Jim Patterson. Members of the Proposition 1A Legal Team will also be there along with local leaders. Invited guests include Senator Andy Vidak. Those who attend the fundraiser will have a chance to hear elected officials speak about key issues adversely affecting agriculture in the Central Valley which include California high-speed rail and water. Attendees will also have a chance to personally ask the legislators questions. “This is an historical event where our legislators will stand shoulder-to-shoulder with Central Valley citizens and agriculture to call on our state to be accountable,” said KCFB Executive Director Diane Friend. A fundraising sponsor lunch with special guests will be followed by a lunch reception. Sponsorship and ticket information inquiries should be made via email to CCHSRA Board Members Alan Scott (a_scott1318 [at] comcast.net) and/or Helen Sullivan (sullypnh [at] wildblue.net). Kings County Farm Bureau is a non-profit advocacy organization, which represents approximately 800 members of the agricultural community. The mission of KCFB is to provide education, promotion and representation of agriculture. contact Shelli Andranigian at andranigianmedia7 [at] att.net. Thank you. Hanford, CA February 6, 2014 – Citizens for California High Speed Rail Accountability (CCHSRA) and the Kings County Farm Bureau (KCFB) will co-host a fundraising luncheon/reception to “Protect Agriculture and The Valley” on Thursday, February 20th, 2014 at the Civic Auditorium in Hanford, California. Special guests include Congressman David Valadao, Assemblyman Frank Bigelow, Assemblywoman Shannon Grove, and Assemblywoman Diane Harkey along with invited guests Senator Andy Vidak and Assemblyman Jim Patterson with others TBA. Those who attend the fundraiser will have a chance to hear elected officials speak about key issues adversely affecting agriculture in the Central Valley, which include California high-speed rail and water. Attendees will also have a chance to personally ask the legislators questions. Citizens for California High Speed Rail Accountability (CCHSRA) is a nonprofit, nonpartisan advocacy group based in Kings County whose members reside in the city of Hanford and surrounding rural areas, along with other Californians who are affected by the high-speed rail. The group has been in the forefront since June 2011 attempting to get the California High-Speed Rail Authority (CHSRA) and its board to be in full compliance with Proposition 1A, which the state’s voters passed in November 2008. For more information, please visit us at http://www.cchsra.org/ and/or contact Shelli Andranigian at andranigianmedia7 [at] att.net. Thank you. February 3, 2014 – The winning parties in Sacramento County Superior Court against the California High-Speed Rail Authority now fight back against an attempt by Governor Jerry Brown to help the Authority evade public accountability by seeking extraordinary relief from the California Supreme Court. Parked outside a California High-Speed Rail Authority board meeting remote location – April 4, 2013 in Fresno. Gov. Brown (along with State Treasurer Bill Lockyer and Attorney General Kamala Harris) wants the state to proceed with borrowing money for construction of the 29-mile Madera to Fresno high-speed rail segment by issuing Prop. 1A bonds, even though the California High-Speed Rail Authority has not complied with the law, as confirmed in 2013 by a judge.